The city of Vancouver has approved a new zoning policy that will permit the construction of duplexes in 99% of single family neighbourhoods. The change will mean about 67,000 single family lots which comprise approximately 52% of Vancouver’s landmass, are now eligible for duplexes. 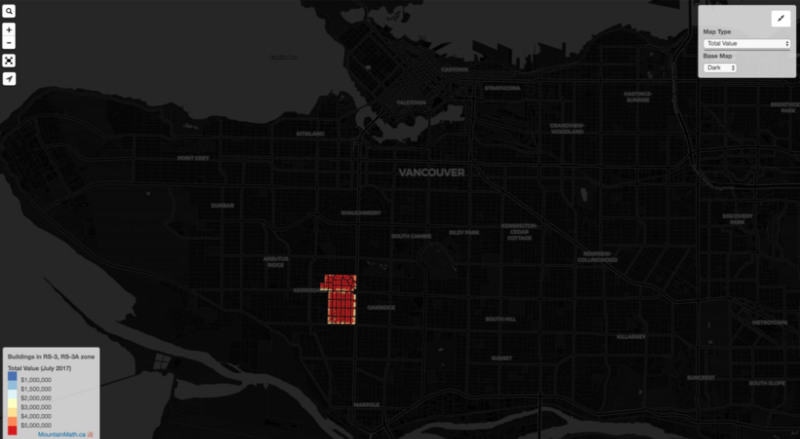 According to local data analyst Jens Von Bergmann, there will only be 576 lots remaining in the city of Vancouver which will remain a part of the single family zoning. Remaining zoning for single family homes in the city of Vancouver. While typically up-zoning increases the value of the land, it’s unlikely to spark a speculative fever in the city’s detached housing market, where home sales have tumbled to record lows through the first eight months of the year. 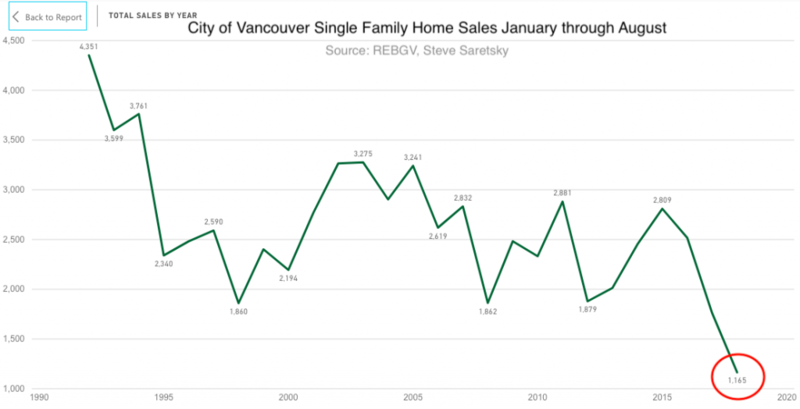 City of Vancouver single family home sales January through August. Building duplexes from an investment or speculative perspective is simply not profitable in today’s environment. For example, with the typical costs of a teardown home on the West side currently hovering around $2M, and a minimum buildable cost of $300 per square foot, this would put your typical 1/2 duplex at (back of the paper math) $1.8M after factoring in all costs, including property taxes, realtor fees, and a developers lift (typically 15-20% net profit). In simpler terms, in order for a developer to speculate on buying up land to build duplexes, they would need to sell the completed units in the open market at about $1.8M on West Side, and closer to $1.3M on the East side. To suggest there’s an appetite for nearly $2M half duplexes would be optimistic at best. Although, speculating on duplexes for profits would certainly be a more feasible strategy at the bottom of the cycle when land prices fall and profits can once again be maximized.